Suborder: Ventral cirri not as distinct files, except Gastrostyla. Family: Frontoventral cirri scattered on forward, mid- and rear areas of ventrum. Genus: Marginal cirri not confluent at rear; oral cavity wide, expansive; caudal cirri (usually 3) prominent (Illustrated Guide, 1985). 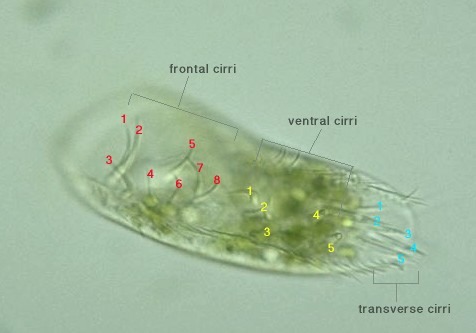 Cell body ovoid to elongate, inflexible; large AZM supported anteriorly by a collar; two rows of marginal cirri not confluent posteriorly; strongly-developed frontoventral & transverse cirri present; three long, stiff caudal cilia; dorsal surface ornamented by short rows of cirri; two macronuclei; cyst stage recorded in some species (Carey, 1992). 8 (3 + 2 + 3) frontal, 5 ventral, 5 transverse, 3 caudal cirri.